ZAMORA AND UNDER ARMOUR FOR SOUTH AFRICA? Not content with already knocking out the likes of holders Shakhtar Donetsk and Italian giants Juventus, Fulham marched in to the semi finals of the Europa League on Thursday night after completing a 3 – 1 aggregate win over Wolfsburg. Once again, the player at the heart of their success was striker Bobby Zamora. The one time West ham misfit knocked in his 19th goal of the season, this one with just 21 seconds on the clock, as the Londoner’s won 1 – 0 on the night. And what a goal it was too. Taking a pass from Zoltan Gera he did an admirable impression of Johan Cruyff to create some space for a classic left foot finish. It marks the continuation of an amazing season for Zamora and ups the possibility that he, along with his Under Armour Dominate Pro football boots, could be packing his bags for the World Cup this summer. If so, what a coup that would be for the American company after many fans ridiculed their choice of Zamora as a brand ambassador when they first came upon the scene last season. In fact, Zamora has been an inspired choice for UA. 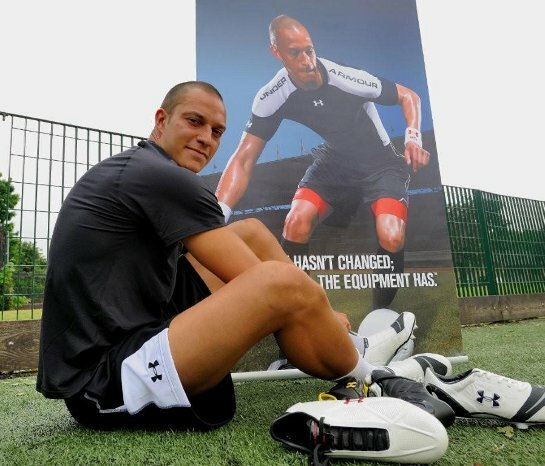 Not only has he been banging in the goals, but he seems fully committed to the Under Armour brand, as opposed to just being happy to take the money. Sure, some of the PR events that UA have put on haven’t been as glitzy as what we have come to expect from the likes of adidas and Nike, but in terms of making a connection with the ‘common man’ or ‘amateur player’ they do looked to have worked well with Zamora at the heart of them. The England striking conundrum is one that is often discussed in the media, with many experts asking who coach Fabio Capello will take to partner Wayne Rooney. Crouch, Bent, Heskey, Agbonlahor seem to be the names in the frame but surely now Zamora must be in with a chance of getting added to that list. This season everyone’s realised what we did last year: that in Bobby we have a very good player. I’m sure that when Fabio Capello is looking at the players available to take to the World Cup he will make his assessment. I know Fabio is aware of Bobby as a player, but Bobby can’t do any more himself. Among the 1,000 Fulham fans in Germany last night was actor Hugh Grant. Four weddings, a funeral and now a World Cup could well be on the cards. So, is Bobby Zamora a real candidate for a place in Fabio Capello’s squad? Have Under Armour made the signing of the year? Let us know your thoughts by commenting below. talking to people that have ACTUALLY WORN these boots, ive heard the same thing over and over again: extremely comfortable boots. im not so much for the style myself, but shouldn’t comfort be a top priority for players? I know most people don’t like the looks but I think they look like a pretty good fit. No nonsense upper for a clean touch. At least on the ones Zamora was wearing. But I haven’t worn them so I don’t really know. I’m just saying they look kinda nice. I wouldn’t mind wearing the white dominate pros that Zamora was wearing. The only thing that I’m wondering is why I should get these boots over other boots on the market? They’re nice, but more advertising has to be made on the technical specs of the boots; for example, what is the black part on the Dominate Pro for? Ball grip? Back to the actual boots… Dominate Pro’s bottom looks exactly like American football studs. I’m not sold on the looks and definitely not on the price. I’m pretty certain they’ll be half that price by middle of the summer. With Zamora on this form he could have the confidence to play at the WC. Problem is he has no experience at international level so I cant see Capello taking him. Jed that is true, but proving himself against some of the best teams in the World must count for something? He needs to get an international call up now otherwise he will never get a chance. When he was at Brighton scoring 77 goals in 3 seasons just shows he really is an amazing talent! 19 goals so far and sure he will get over 25. Zamore shouldn’t be taken to the WC in front of Bent, Crouch, Defoe or Rooney. If we take 5 strikers then this should be the 5 though. Then Cole, Johnson, Terry, Ferdinand, Lescott, Baines, Brown and Upson. I pretty much agree with what FUZZY has just said in terms of England squad selection. That “black part” on the front of the foot btw is the MPZ (Metatarsal Protection Zone) designed not only to protect the metatarsals (what a surprise!) but to increase shot power. hey i have seen a player with new under armour boots, not dominate not create, do you know something ??? theres one thing playing for fulham in the ueafa cup and theres another playing in the world cup. ive watched zamora from brighton to fulham and its really exceeded his ability but i put that down to a great coach in hodginson (manager of season). but having said that the world cup throws upa surprise or two in selection. IF zamora performs against Hamburg, its going to be hard to ignore him and he may get a call up for the mexico match. as for the boots UA are a firm going places and to watch out for – personally cant speak for the boots but they dont do a lot wrong technically. Personally I think the boot (dominate) looks pretty good. really keen to try them after seeing people promote how comfortable it is. But the price wise is certainly not effective. rather stick with my vapor v and tunit i at e moment. so is this the new criteria for selecting strikers for the world cup? one good season? all respect to zamora, went to see fulham a few times and he has improved, but he’s not even international benchwarmer standard. he doesn’t have that cutting edge for a forward that is so necessary. rooney, defoe, crouch, agbonlahor, bent and heskey have more experience. also, i thought he switch to T&T?? think as a manager/coach.. you got to consider players who are in good form.. no doubt he might lack the international experience but you need somebody who has that confidence already going to step up the game and score. the UA boots are VERY COMFORTABLE. The dominate pro’s are kangaroo leather, and completely waterproof so they dont get any heavier while playing on wet surfaces, and they don’t lose friction in contact with a wet ball. stud pressure is decreased and the insole molds to your foot. Not the best looking or lightest boots in the world, but super comfortable.